We don't traditionally think of 1902 $20 blue seals as being scarce, but they are very rare as territorials. Currently only about 20 are known to exist. These were not printed until 1908; by that time there were very few territories left. 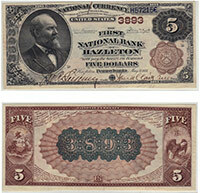 The value of any note like this is largely based on the condition and issuing location. Most are worth thousands of dollars, some can be worth even more than that. Contact us for an exact quote. Don't forget to check the serial number. Number 1 notes always sell for nice premiums.